Techniques for Adjusting yoga postures. In this workshop you will gain an in-depth understanding of the purpose and use of hands on adjustments for yoga postures. The course is focused on gaining confidence in providing safe, effective and awareness - orientated hands on adjusting techniques. You will learn why, when and how to apply great adjustments to your students. 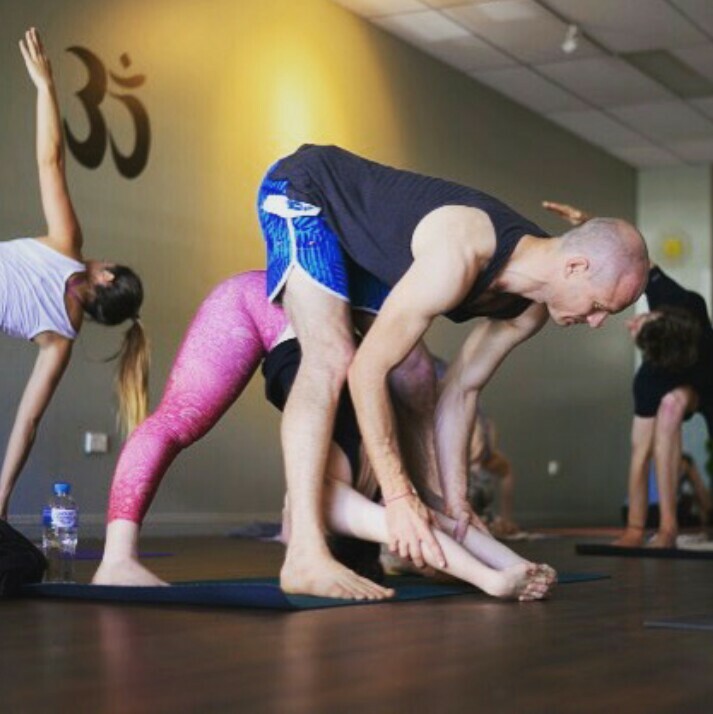 These assists can be an excellent tool for yoga teachers, the skills you will learn in this workshop will go a long way in building the relationship that you have with your students and instilling trust. Throughout this course you will get to practice hands on adjustments on a range of body types, showing you how to modify adjustments to suit different variables such as height, flexibility, strength, level of practice or working with students with injuries. Developing confidence to apply effective assists that are tailored to each individual situation. Good adjustments enhance alignment, promote safety, support the flow of prana and challenge and deepen the experience of the pose. We will cover standing postures, seated postures, backbends and inversions. This workshop is open to both teachers and practitioners from all yoga asana styles. Not only will you gain the skills to apply hands on adjustments you will also gain a deeper understanding of the postures themselves. Bookings to earleyyoga@gmail.com or in person at the shala. In this workshop we'll be breaking down, exploring and working on the most common postures and transitions people are challenged by, or get "stuck" on in the Ashtanga yoga primary series. These gateway poses when faced with, will test our internal strength, flexibility and devotion. The gateway of the standing postures lies with Uttthita Hasta Padangustasana (standing head to knee pose) and Parivrta Parshvakonsana (revolved side angle pose). Then comes the four Marichyasana poses (poses dedicated to the sage Marichi) these gateway asanas require a series of binds where you clasp your hand either behind your back or around your leg in a twisted posture and maintain either half lotus or a very strong extended leg. Marichysana D is the pinnacle of this portion of the series, being the most difficult twist and half lotus combination. Bhujapidasana (knees on the shoulder pose) also challenges our strength, hip flexibility, and our fears of falling. Then comes our biggest challenge and gateway posture, Supta Kurmasana where internal strength, external rotation and forward bending are challenged to a high degree in order to get both legs behind the head. Garbha Pindasana (embryo in the womb posture) and Baddha Konasana (bound angle pose) will get a special mention too! Then of course Backbending or Urdhva Dhanurasana will be focused on too. In addition to these gateway poses we will be working on the transitions into and out of these including jump backs and jump throughs. Yoga is the stilling of the modifications of the mind. Yoga is often understood to be series of postures and breathing exercises for nurturing health, balance and harmony in the body. However the treasures of Yoga span far beyond the physical. All authentic Yoga practices have at their heart a gradual quest towards understanding, and sublimating the mind. Eventually merging the individual self in meditation (samādhi). The Yoga Stras, compiled by the Sage Patañjali, are the primary text of Yoga Philosophy. This ancient text is presented in short, often terse, 'sutras' or threads, which are unfolded by contemplation to reveal their wisdom. The Sūtras cover a broad range of topics regarding practice, the mind, the pitfalls of practice, aṣtānga yoga, meditation and enlightenment. Swami Jasraj Puri presents the Yoga Sūtras with mind to their import to daily life. Infused with anecdotes and experiences of living more than 20 years as a monk in India, his down to earth style and practical examples make the Sūtras accessible to all. Each session of the course will include a discourse on a section of the Sūtras and a group meditation. Mahamandaleshwar Swami Jasraj Puri was born in Sydney and graduated as a Physiotherapist from Sydney University. He started teaching Yoga in 1995 and, soon after, moved to India spending 20 years living in an Ashram, practicing and studying Yoga, Yoga Philosophy and Sanskrit. Whilst there he managed a large Yoga retreat centre, taught meditation and yoga, founded a school and college for local students and lectured on Yoga Philosophy in countless programs throughout Northern India. In 2010 he was given the honorary title of Mahamandaleshwar in the Haridwar Kumbh Mela, the highest title of the traditional Hindu spiritual order of monks. He was the first 'western Swami' to be accorded the title. In this fun interactive workshop we will explore different techniques to develop greater control and ease in our jump back, jump through and jumping forward movements. Both from seated postures and in our Sun salutations. Core strengthening exercises will be covered as well shoulder and chest opening. Start working towards that magical floating movement in our practice. Email Aaron for bookings and payment.